In my last post I showed how the 2D TOCSY experiment can be used to identify individual “spin systems” or subunits within a molecule, or even within different molecules. Well, there is a very closely related, one-dimensional version of the TOCSY experiment that uses something called “selective excitation” in place of a full 2D experiment. This has the advantage that it is both quicker to run and easier to understand. The basic idea behind this so-called 1D TOCSY experiment is quite straightforward: first, a combination of shaped rf pulses and magnetic field gradients is used to selectively excite one signal in the spectrum; then, a special pulse sequence element called a “spinlock” is used to transfer magnetization from the “excited” spins to the other spins in the spin system, in exactly the same way as is done in 2D TOCSY. The result is a 1D spectrum in which only signals that appear from those that are in the same spin system as the excited signal. This 1D TOCSY experiment can be very useful in a number of situations, particularly when there is considerable overlap in the spectrum. It’s a quick experiment, too, typically taking only a minute or two to run. Let’s return to our mixture of 2-pentenal and 5-epoxyhexene. As discussed before, the proton spectrum shows a lot of overlap between the signals from the two sample components. Fig. 1. 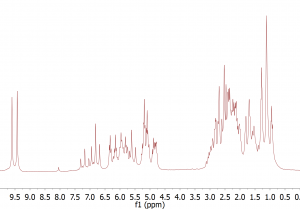 Proton spectrum of a mixture of 2-pentenal and 5-epoxyhexene. The spectrum shows considerable overlap between the signals from the two components. 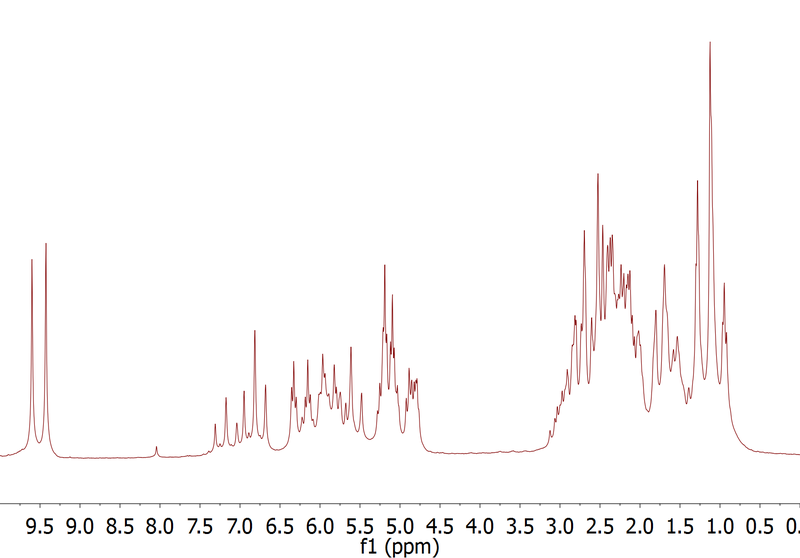 However, there is one well resolved resonance at 9.5 ppm, that of the aldehyde in 2-pentenal. With TOCSY 1D we can selectively excite this signal, as shown in the lower spectrum of Fig. 2 below. Then, we can use a TOCSY spinlock to transfer magnetization from the aldehyde proton to the other protons in the 2-pentenal spin system, resulting in the top spectrum of Fig. 2. Fig. 2. 1D TOCSY of sample of 2-pentenal and 5-epoxyhexene. 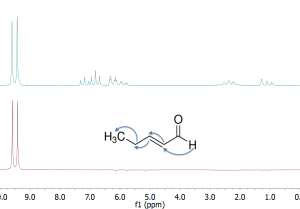 In the lower spectrum, selective excitation of the aldehyde resonance was achieved using a double pulse field gradient spin echo (DPFGSE) with a pair of “q3” Gaussian Cascade shaped frequency-selective pulses. 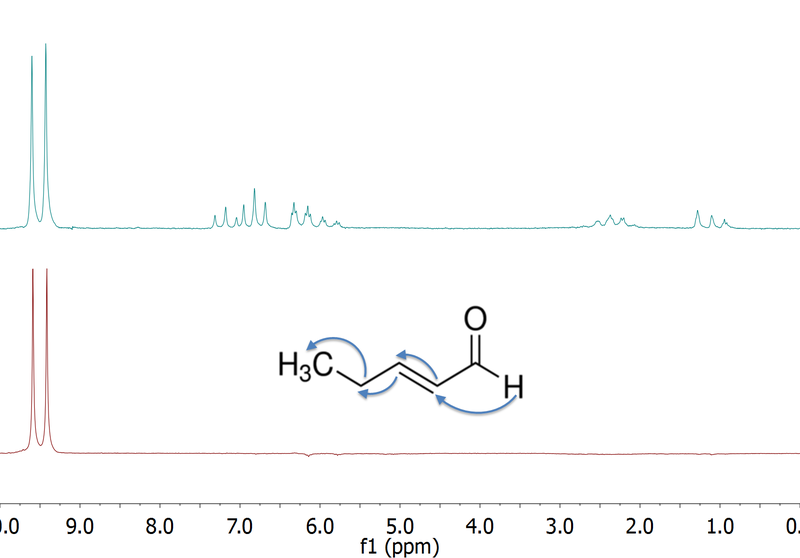 In the top spectrum, an additional TOCSY transfer from the aldehyde proton to other protons in 2-pentenal was achieved using a 150 ms DIPSI-2 spinlock. Undesirable zero-quantum coherence responses were suppressed using the method of Thrippleton and Keeler1 that employs a pair of adiabatic pulses in the presence of field gradients. Fig. 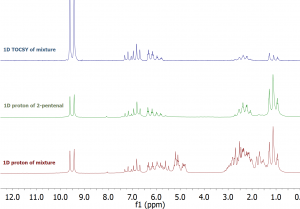 3 below shows a comparison of the TOCSY 1D spectrum of our sample mixture with the original proton spectrum of the mixture and a proton spectrum of pure 2-pentenal. Fig. 3. 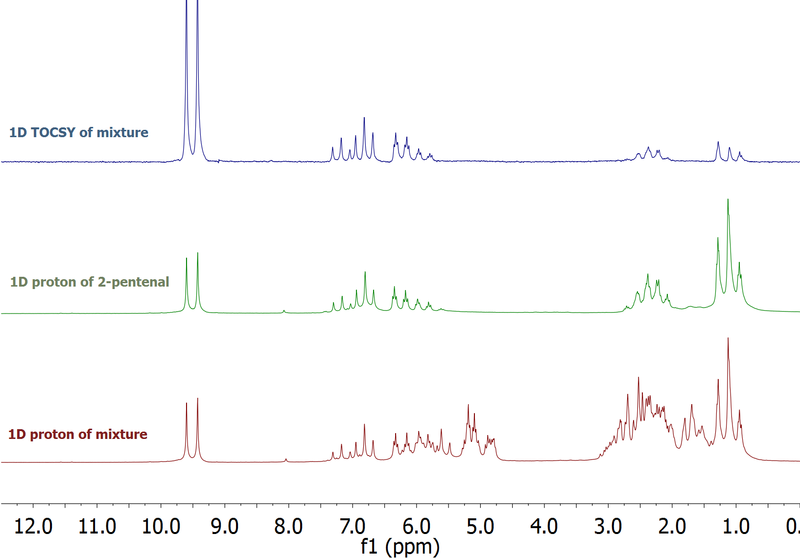 Comparison of 1D TOCSY spectrum of a mixture of 2-pentenal and 5-epoxyhexene with the proton 1D spectrum of the mixture and the proton 1D spectrum of 2-pentenal. As you can see, in addition to aiding the identification of spin systems, the 1D TOCSY experiment also provides a very powerful way of “editing” the spectrum to remove signal overlap and simplify the spectrum – only signals from 2-pentenal show up in the 1D TOCSY spectrum above. “Elimination of Zero-Quantum Interference in Two-Dimensional NMR Spectra”, Michael J. Thrippleton, and James Keeler, J. Angew Chem Int Ed 2003; 42; 3938-41. Many thanks to Dr. Alan Kenwright of Durham University for the sample used here and for the generous use of their Spinsolve system equipped with gradients.